If you remember from last week, we said that we want to consider these commitments one at a time. Last week we looked at worship. We talked about what worship is and the importance of worshiping God together as a family. And together we considered the first commitment from the Challenge and Power of One. “With God’s help I commit to worshiping one day weekly with my church family this year.” A number of you made that commitment, and you are here today. Praise God! When it comes to attendance, numbers themselves are not important, but people are. You are important, and it’s good that you are here. I pray that God will continue to grow the number of people who come to worship him here at Plantation Community Church. “So, what’s all this talk about ‘serving’ in the church? I mean, I thought church was all about what the church can do for me, not what I can do for the church. Don’t get me wrong, I enjoy church. I wouldn’t miss it. I enjoy the worship service. I like the songs, I feel close to God when we pray, I like seeing the kids up on stage, and I look forward to getting something out of the message. And I enjoy the fellowship time, too. It’s nice to see everyone and to catch up with people over a donut and cup of coffee. I like it when we do those big events like the church picnic, or the fall festival or the float in the parade. It’s great seeing everybody come together like that. Have you ever felt that way? I’ve got to tell you, there are a whole lot of people in churches all across the country who feel exactly that way. They may never come right out and say it, or express it that clearly, but that is exactly how they feel about church. “Church is not about what I can do for the church, but what the church can do for me.” They are not interested in ‘service’ in the church, but only in what the church has to offer them. Well, one of the things the church has to offer you is the opportunity to serve. And if you already enjoy church without serving, get ready for some good news. Because church life only gets better when you get involved. It’s like anything in life. The more you put into something, the more you get out of it. The church is a family, and if you are not involved in service in the church, it is really hard to feel a part of the family. But once you get involved in service, once you find your place, you will find that you love your church family even more than before. 1) Jesus came to serve, not to be served. 2) God has given you gifts for service. 3) Everyone needs to do their part. Stop and think about that for a minute. Jesus Christ is the Son of God. He was with God in the beginning, and he was God. All things were made through him; without him nothing was made that has been made. All things were made to serve God and his glory. So, as the Son of God, Jesus Christ had every right to come into our world expecting to be served. By all rights we should have waited on him hand and foot, tending to all his needs, putting his needs before our own. That was Jesus’ right as the Son of God. But when Jesus came into the world, he put all his rights as God aside. Philippians 2:6 says this about Jesus: that although he was “in very nature God, he did not consider equality with God something to be grasped.” The New Living Translation puts it this way: “Though he was God, he did not demand and cling to his rights as God.” As the Son of God Jesus had every right to be served rather than to serve. But he willingly set his rights aside, and as Philippians 2:7 goes on to say: “He made himself nothing, taking the very nature of a servant.” Jesus Christ set aside his rights as God when he came into the world. He came as a servant. Why did Jesus do this? Why did he set his rights aside and come serving rather than being served? Jesus answered that question the night of the Last Supper with his disciples. The gospels tell us that Jesus and his disciples gathered that night in an upper room to share a Passover Meal together. It was customary in that day and culture to wash your feet upon entering someone’s home, and especially before sharing a meal together. This was often the job of a household servant when guests came to the house. Jesus was “Teacher” and “Lord,” and by all rights the disciples should have washed his feet. But Jesus washed the disciples’ feet to set the example for them so that they might serve others. 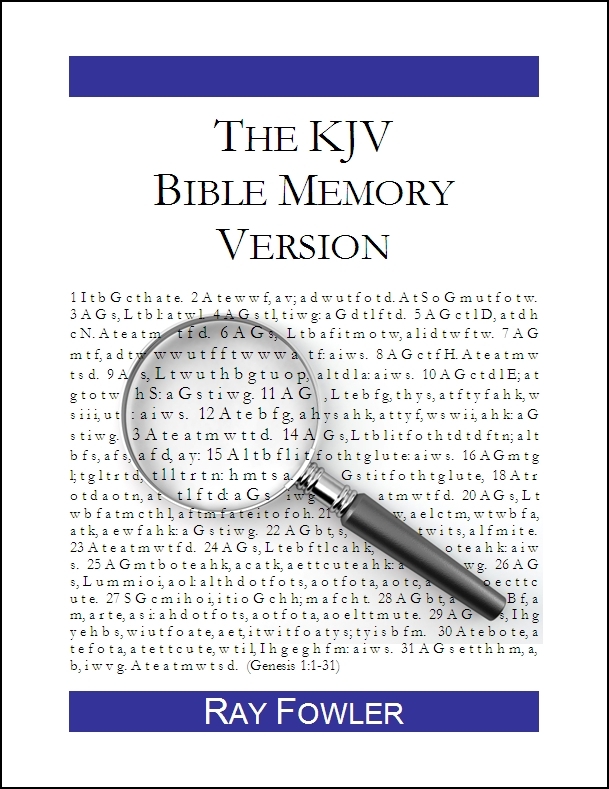 Now let’s jump back to Philippians 2. This time we’ll back up to verse 5 so that we can read Paul’s full instruction to the Philippians: “Your attitude should be the same as that of Christ Jesus: Who, being in very nature God, did not consider equality with God something to be grasped, but made himself nothing, taking the very nature of a servant.” (Philippians 2:5-7) Why should you care about serving others? Because your attitude should be the same as that of Jesus Christ who set aside his rights as God and took the very nature of a servant. Jesus set the example for you that you should do as he did. Jesus came to serve, not to be served. Notice the two words you find at the beginning of verse 7: “each one.” “To each one of us grace has been given as Christ apportioned it.” God has given each one of us gifts and abilities to serve him and each other. Each one of you has certain talents, skills and abilities which you can use to serve God and the church. If you are a Christian, then God has also given you spiritual gifts. Spiritual gifts are special gifts given to believers in Christ through the Holy Spirit for the specific purpose of serving the church. But whether we are talking about spiritual gifts, or natural talents or learned skills, all of these are gifts which come from God, and God desires you to use the gifts he has given you to serve others. Ephesians 4 goes on to talk about apostles, prophets, evangelists, pastors and teachers. We are probably most familiar today with the final category in the list of pastor and teacher. Many people have the mistaken idea that the pastors and teachers are supposed to do all the work of the church while everyone else just shows up. Nothing could be further from the truth. The point is this. Everyone can do something. God has given you gifts for service, and he expects you to use them in the service of the church. Paul uses the illustration of the human body here to teach about the church body. The human body is joined and held together by every supporting ligament. Every part is important. And unless each part does its work, the whole body flounders and falls apart. If the eyes and hands and legs all decided to take a break, the whole body suffers. It’s the same with the church. The body of Christ can only grow and build itself up in love as each part does its work. Everyone needs to do their part. There is an old maxim that in the typical church 20% of the people do 80% of the work. I’ve been in a lot of churches over the years, and I would have to say that is pretty accurate. And unfortunately, two things happen when only 20% of the people do 80% of the work. The first thing is that the church does not fulfill its potential. It does not do all that it can do. 20% of the people can only do so much. And so, what often happens is that things get left undone or never even started. New ministries which might have sprung up in the church never see the light of day because the church is struggling just to keep the most basic of ministries going. And so, the church never fulfills its true potential as a church. That’s sad. The second thing that happens is that people get burned out. Already overloaded people take on new tasks because nobody else will, and they eventually get burned out in the process. It’s not easy for the 20% who are carrying 80% of the load. I’ve got to tell you, they usually carry that load cheerfully and with little complaining because they love God, they love their church and they love to serve. But it would be so much easier if everyone worked together. Now obviously we do not want the church doing less than it should or individual people doing more than they should. So, what’s the answer? Everyone needs to do their part. The body of Christ can only function in a healthy manner when everyone contributes. Now some of you are saying: “That’s an easy commitment. I’m already serving in twelve ministry capacities in my church family this year!” But others of you are not serving at all. Perhaps you’ve never even thought about serving at the church. Or perhaps you didn’t know that you could serve in the church or didn’t know what you could do in the church. I hope today’s message has shown you that you can serve your church family, and that there are lots of different ways to serve. If we all pitched in together, it would lighten the load for those who are already serving in so many areas. And it would also open up new opportunities for us to minister as a church family. In order for the church to grow and build itself up in love everyone needs to do their part. CONCLUSION: So, are you ready to make Commitment #2 from the Challenge and Power of One? If you are, I will give you the opportunity to make that commitment to God when we close in prayer in just a minute. And then I would encourage you to do three things. First of all, share with at least one other person that you have made this commitment. If you made Commitment #1 last week and shared that with someone, you could share with the same person. 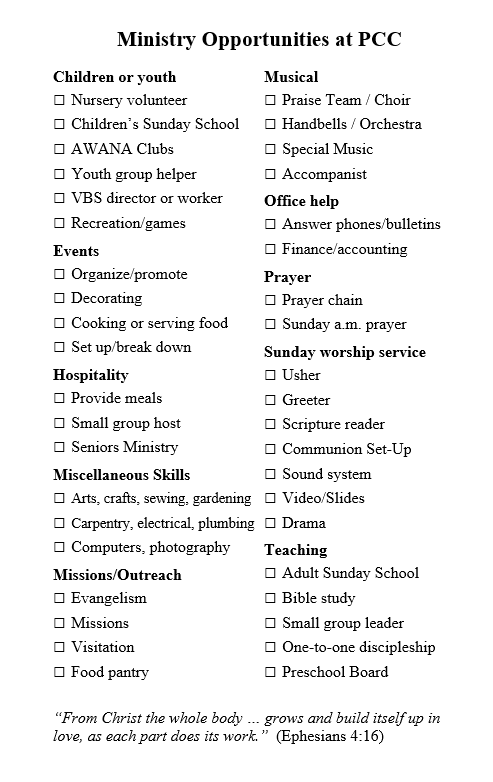 Secondly, I would encourage you this week to look over the list on your bulletin insert and identify the various ways that you could serve. Think of the gifts that God has given you and how you could use them to serve the church. Check off the ones that seem to apply and then pray about them. Ask God where he would have you serve. And then thirdly, step forward. Choose one area to serve and then do it! Talk to one of the pastors or one of the deacons about where you would like to serve. Or if you see someone doing a task that you would like to help out with, go up and talk to them about it. But get involved. Have the same attitude as Jesus who came to serve, not be served. God has given you gifts for service, and everyone needs to do their part.